Hey guys, I’m Aaron, another participant in the From Ember To Inferno Firestorm Campaign. Following on from Hobby Celebrity Paul Buckle, I wanted to just write a little intro about the army I have chosen and the inspiration behind it. The campaign was very spur of the moment in its inception, just idle chit chat around the Firestorm release in a Whatsapp group. We discussed the perfect number for a campaign of this sort being 4 or 6 players, ideally all experienced with these types of gaming journeys and committed enough to stick to deadlines. As it happens, the 4 people currently active in the chat we’re all considering new armies or already had ideas in the pipeline, those being Paul, Myself, Chris and Matt. Chris already had an order army in its early stages and Paul had some cool ideas for a destruction army, and I mentioned that it’d be super cool if we each picked a different Grand Alliance. This left Matt and I to decide who would play death and who would play chaos. My latest project had actually been a chaos army, so I wasn’t particularly enthused to do another one and I didn’t feel like adding to the existing one would really work with the spirit of the campaign. I’ve had multiple death armies previously, including playing the original Lustrian Zombie Pirates list back in the day, so the fact that I could now redo that kind of list, only with all the awesome new models and kits released since then instantly got captured my excitement. Matt to me has always been a chaos guy and he’s done many chaos armies in the time I’ve known him, and he was happy to start yet another, so there we were. I’m yet to have finalised a name for my general or my fleet itself, but I have made all my purchases and planned out all the conversions and kitbashes and models for my army list plus what I’ll be adding each month; I’m super excited. 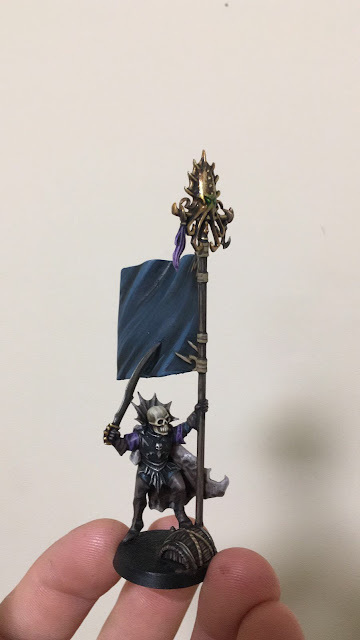 I’ve got with an undead corsair theme, using the Dark Aelf Black Ark Corsair models as a base with skeleton heads and arms. A very simple yet (imo) effective combination. My general is a fearsome Vampire-Pirate Lord with the power to mark his foes with ‘Black Spot’ marking them for death and unleashing a Kraken-like leviathan (affectionately known as Squid Vicious) to pursue them across land and sea. In game terms, this will be represented by a Vampire Lord on foot carrying the Sword of Unholy Power. This will allow him once per game to summon a Mourngul without the chance of failing and without the enemy having the chance to unbind the spell. Modelwise, these will be represented by Lokhir Fellheart and a Kharibdyss. I also have plans for animated ships’ figureheads that descend from the fleet to bring death to the enemy (represented by Morghasts), and a spectral apparition of a sunken ship and the spirits of those who drowned aboard it, who even in death protect its necromantic treasures (to stand in for a Mortis Engine). Super excited to get tucked into this project and get them on the table with the other guys’ awesome armies. 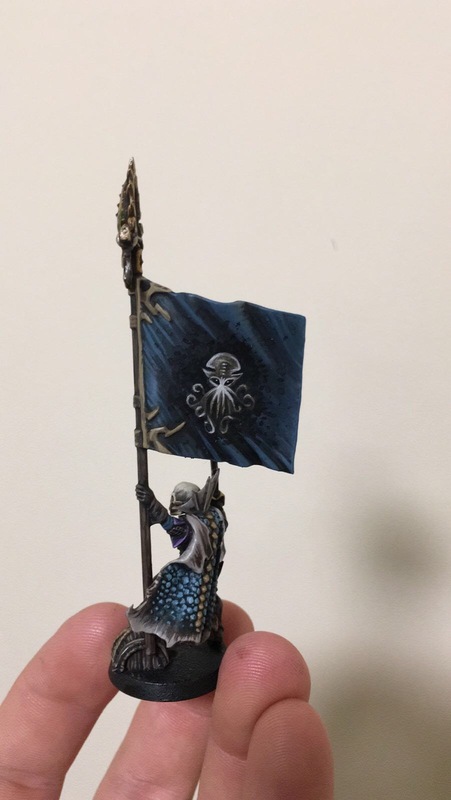 Matt - Aaron has really pushed the boat out for his first model, not only looking to get the colour scheme in place but painting some fantastic free-hand. Aaron has a very unique painting style which is almost artist/comic style in its effect; with a jagged highlight style. He has also gone for quite a muted colour scheme so I am very interested to see how this looks on-mass.